This letter is to all of our conservative friends in the formerly great state of California. Have you had enough yet? With new anti-gun legislation, more spending, more taxes, and a nearly bankrupt government that wants to take money from you and give it to people who don't produce... I bet you are fed up, and I don't blame you! New York recently went off the deep end and passed some of the most restrictive anti-gun legislation in history. Not to be outdone, your California libs are proposing requiring you to purchase insurance for your guns! 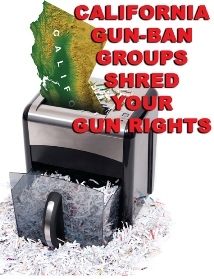 Many other unconstitutional gun restrictions are being imposed on you this session. Is this the straw that breaks the camel's back for you? Here is a solution. Pack your stuff, sell your home and move to Texas! Things are great here in the Lone Star State! Texas Governor Rick Perry recently launched a series of ads targeting California business owners asking them to consider moving here. He is getting in Gov. 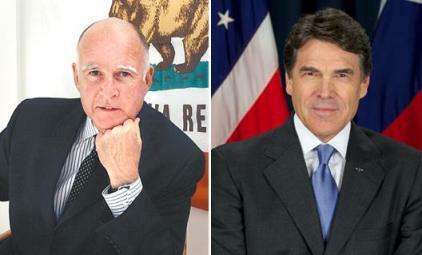 Moonbeam's face and taking it to your state. Who would you rather have as your governor? A man who dances in the moonbeams of a Linda Ronstadt song or Rick Perry who shoots coyotes with a pistol he carries while jogging? In response to Gov. 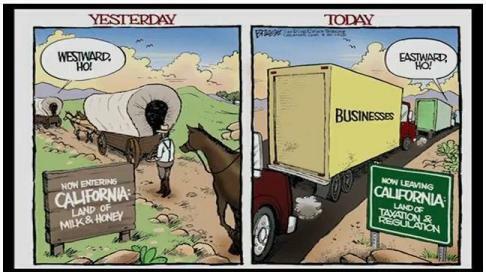 Perry's marketing efforts in the once Golden State, Gov. Moonbeam said, "Anyone with half a brain is moving to California." Governer, truer words have never been spoken. And everyone with a full brain is moving to Texas! If California businesses are going to be moving to Texas, you might as well too. And do it quick, before that giant sucking sound you hear is the great unemployment vacuum that used to be the California economy. What's not to like? We have great housing prices. We don't have a state income tax and we threaten to lynch any politician who suggests one. We will let you keep your guns and ammo without registering them. And heck, if the state legislature passes its new open carry bill, you will be able to strap it on your hip if you so desire. Oh, and none of that silly ten round magazine capacity limit either! Jobs are plentiful in Texas. Good paying jobs in many sectors including oil and gas, high technology and construction. And, since your boss is going to be moving here soon, you might just be able to keep your old job when you get here! We have beaches, mountains, beautiful forests and rolling hills. We have the second largest number of lakes (watch out Minnesota, we're coming for that record too). We have great hunting and fishing and the warm water Gulf of Mexico with no great white sharks! 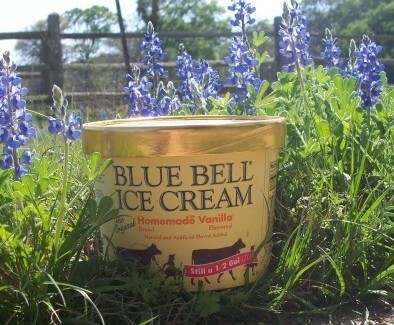 Not to mention bluebonnets in the spring and Blue Bell Ice Cream all year round! Transportation is good and will continue to improve. Our cost of living is relatively low. Ladies, we have real Texas men who know how to treat a lady. And guys... well, Texas women are legendary. You just gotta love it here! And the really great thing is if you move to Texas you just might have the time and the money left over to go visit California and play in all her great resources without all the hassles, taxes and inconveniences of having to live there day to day. All that said, this invitation is only to Conservatives! If you believe in more taxes, wealth-redistribution, run-away spending and excessive governmental regulation of business - Please stay in California. However, if you are a limited government, gun-loving believer in the Constitution, individual execeptionalism and freedom - Texas may just the place for you. Come on down! Texas is Wide Open for Business! I had the pleasure of visiting Texas twice this past year, and once I got used to your wacky freeway interchanges, I was able to focus on how much I admired your State. A visit to the capital just confirmed what I already suspected. Texans are exceptionally proud of their state, and for good reason. Unfortunately, I cannot leave California without leaving behind 300k in lost equity in my house. Perhaps when the real estate market recovers...keep a light on for me.